This project first appeared in MAKE Volume 38, on pages 76–77. The Ergo(nomic) Mouse was originally developed as part of my Design Modelling online tutorials, to demonstrate ways to work with styrofoam modeling foam. However, it quickly evolved into a more complex project detailing how to “Frankenstein” a wireless mouse PCB to put the controls where the user wants them, and how to finish the foam with various surfaces, including a first: creating “Sugru skin.” Instead of spray-painting, this technique gives your models a novel, tactile finish using the popular air-curable, moldable silicone rubber. 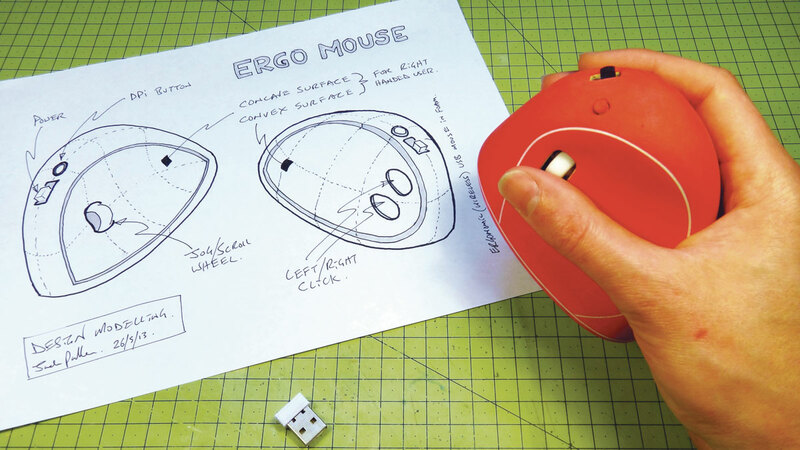 Here are some of the steps involved in creating the Ergo Mouse. Read the complete Skill Builder online and you can use these techniques however you like! When sawing and sanding foam or fillers, use a particle mask or respirator for protection — small airborne particles are dangerous. 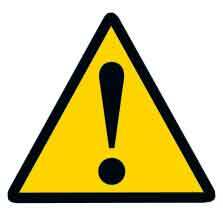 When working with wet fillers, the fumes can be harmful, so use good ventilation and a mask that protects against fumes. 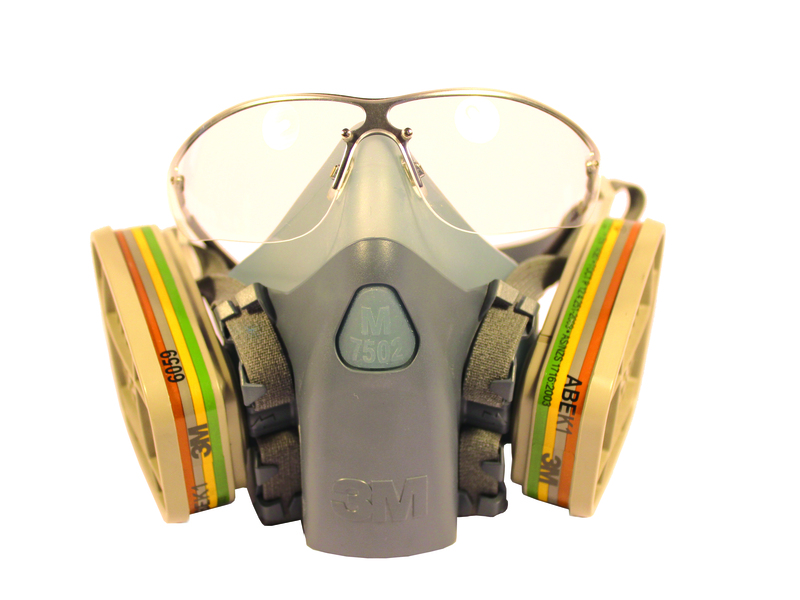 One of the safest all-around respiratory filters is 3M’s 7500 series multi-purpose “half-mask,” with cartridges such as 3M’s 6059 (ABEK1 rated) or 60926 (NIOSH approved), which protect you against particles and against organic and inorganic solvents.Please read the warnings on whichever products you intend to use. Gloves are recommended when working with fillers and Sugru, and close-fitting goggles are also a good idea to keep particles and fumes out of your eyes and protect you against splashes of chemicals and glues,or even shattered knife blades. Water-based filler such as spackle or Polyfilla. Get a fast-dry grade if possible. Chemical-based filler such as U-Pol or car body filler. Get “smooth” or extra-fine grade. Scrap board Glue sandpaper onto it for a flat sanding surface (rough on one side, fine on the other). Hot glue gun Don’t overheat the glue, or it will melt the Styrofoam dramatically! Nonstick surface (optional) for working with fillers. Otherwise, a scrap of cardboard will do. Razor saw such as a Zona saw. You can make your own out of an old hacksaw blade with tape around one end for a grip; ensure that the “cutting stroke” is toward you for a better result. 3. Form the foam for function. 6. Apply styrene strip for definition. 7. Cover with Sugru skin! Step #1: Plan the concept. A quick sketch helps to establish the needs of a product, but the model-making process will usually yield new ideas and insights of its own. Step #2: Frankenstein the PCB. The wireless mouse PCB is cut in half and put on extended leads (as well as features like the Jog-Wheel), to allow repositioning within the foam. Step #3: Form the foam for function. The foam is worked to fit the hand, while roughly positioning the PCB components to check wirelength, etc. The foam model is cut in half and hollowed out, the components are fitted inside, then it’s sealed shut with hot glue. Water-based (white) and chemical (yellow) fillers are applied in a detailed process to finish and strengthen the model form. Step #6: Apply styrene strip for definition. Once the fillers have been sanded back, a typical industrial design model would be ready for spray painting now. However, for the Ergo Mouse, this is when the white plastic strip is applied for feature definition. Step #7: Cover with Sugru skin! The “Sugru skin” technique I developed is detailed in the complete Skill Builder online. It gives a 1mm-thick skin to the model. Sanding back the Sugru gives a tactile finish and exposes the white lines. There are many “ergonomic” mice on the market, intended to help prevent or reduce repetitive strain injury (RSI) for frequent computer users. Although your Ergo Mouse will not be officially certified, it will most likely be a good fit in your hand, and you may look at your personal possessions in a new light — of how to make them better. As with many of my projects on Design Modelling, this project is as much about becoming confident with modeling techniques as how to communicate ideas using physical prototypes. For more of my Design Modelling projects, visit judepullen.com/designmodelling.